The example also applies to haiku writers. It is up to us, those who have been writing haiku for some years, to stop acting as single experts and to set up the systems that will assure us of trained and educated teachers. Where to begin? First of all we have to see where we are, look at how haiku is being taught today, and think about what needs to be changed. Haiku is one of the earliest poetry forms to be taught. Already in grade school, it needs to be taught correctly by teachers who have learned about it in the teacher training programs in the universities. This opens the chicken and the egg situation. Who will teach the professors about haiku so they can in turn inform their students? Perhaps the most logical answer would be that we learn from the Japanese since haiku was first their poetry form. The fiasco with counting syllables is a fine example of how wrong that idea was. No, we cannot give ourselves knives to whack at our poems and each other. 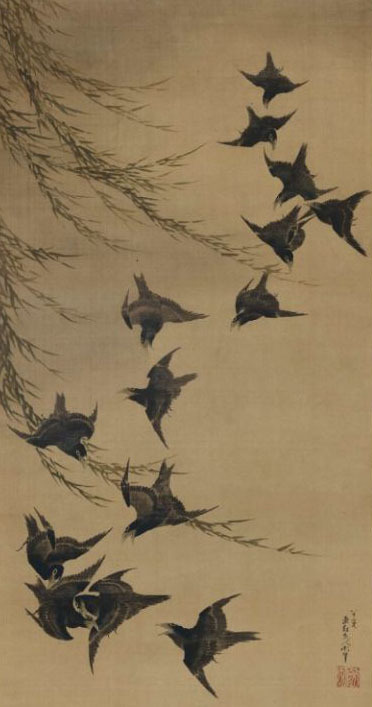 We need to know, and then teach, and to teach to teachers the history of haiku, how haiku work in Japanese, how they work in English, how they are being used by contemporary writers, and how each person can discover what a haiku really is. Naumadd, without re-reading the whole thread I don’t know what your post is referring to specifically, but as a general statement I mostly agreed with it up until this last sentence which I find an odd conclusion since we all switch back and forth between artmaking and analyzing all the time, and to our benefit. (Not to mention the benefits we derive from insights of the more scholarly among us). The only time analysis can pose a problem (when it dominates) is during the act of artmaking itself. Some of the best advice any writer can receive is this: read a lot, write a lot, read a lot more. Over the years, I’ve found the intellectual analysis of haiku far less instructive than simply reading haiku – lots of it and continually – allowing the mindset to sink in and become an instinctive part of how one perceives oneself, others and the rest of nature. Periodically, one must set it aside to focus on real life with the intent of opening one’s awareness to the haiku possibly waiting, possibly asking to be written. Of course, the other part to this education is to write piles and piles of what one currently perceives as haiku. (Knowing a quality car is one thing, having the skill to build or drive one is quite another.) Like mining, one must shovel tons of worthless stone to reveal one worthy gem. I believe it’s worth the laborious digging for the collection of gems one might genuinely create. I’ve not as yet found any shortcuts to the process and I find the excessive analysis a distraction completely missing the point. In my experience, one can analyze or one can learn haiku – one cannot do both at the same time AND they seem to be antagonistic to one another. Sounds like the poets don’t want to “professionalize” the teaching of haiku, don’t want it taught by non-poets, by “professors.” Are there any professors who are also poets out there? Of course there are. They are not responding to the blog, however; perhaps they think it’s a waste of their time. Perhaps they don’t even read this blogspot. The tradition of ELH is much less integrated with education than the traditions of poetry. Today, many good poets teach poetry in universities. Perhaps that’s one cause of the alienation between ELH communities and poets. A few years ago I offered to tutor my daughter’s class in haiku, and ended up with 2 or 3 classes sitting in (they were aged about 10). I was surprised (then, but not now) to have one of the teachers assigned some of the brighter kids say: But I only know if it’s a haiku when I count the syllables. What am I going to do if they don’t have to write 5-7-5? Haiku is taught in New Zealand at all three stages of schooling as part of the English curriculum, but the teachers have been taught poorly. Everyone in the haiku community in this country knows this but, as yet, no one is prepared to really object, protest and see changes made. In the past I have sent an email or two on the matter to the Education Ministry, but have never received a reply. It is no need to teach professors. What is needed is the willingness of the above mentioned professors to learn. The Japanese Mission to the United Nations sponsors an annual students’ haiku contest, with English and Japanese-language sections and elementary, middle school, and high school divisions. The results are often remarkable. But Lorin’s comments are true of most schools, at least in the US. While children are capable of a great deal, the limitations of their teachers are a real factor. And the constraints of standard curricula don’t help much. Tom Painting is a remarkable teacher who has been working in a “School of the Arts” setting. His students rise to the opportunities provided by their teacher and school and the results have been striking in the Virgilio and UN contests. At present, however, I could name no more than six or seven schools in the US that provide similar opportunities for students of haiku. I’m sure there are a few I don’t know about but I’m also sure that they are few. what maybe overlooked too, is the ability to read haiku Jane? that is the only way I know how. be surprised what children will come up with if you ask questions? innercity students in Camden, NJ, for the Virgilio group. . . it wasn’t easy. There is no substitute for actually reading haiku. How do these haiku work? How does this verse that I’m reading now work? How does it fit with the context of haiku written before it and contemporaneously? Despite the popularity of children’s haiku contests in Japan (where haiku are part of the everyday culture as well as written by adults considered to be poets) and Japanese promotion, in earlier days, of haiku as a subject for Western children, and the teaching of it in primary schools in the USA, I have my doubts, as an ex-teacher at secondary levels, that it’s suitable curriculum material in anything but a superficial way for any age group below 15 years at least. The level of inference required for reading haiku-in-English, at any rate, is a mature reading skill which we can’t expect primary school-age children to develop. Not everyone achieves it by the end of their high school years, either. Syllable counting, though, is an exercise suitable for primary levels, and fits with the basics of music and formal rhythm, so I can see why that aspect and that form of ELH is popular in grade schools, whether or not we like the set idea that might give of haiku ‘forever after’. My view might be controversial, I don’t know. i have always loved your stance on things haiku and poetry … its an intuitive ‘knowing’ that speaks to my bones … i cant explain it, i feel it.